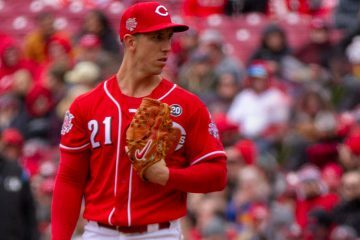 –In the bottom of the seventh, Michael Lorenzen came to the plate to hit for himself after he got the Reds out of a jam (of Ross Ohlendorf’s making) in the top half of the inning. This was Lorenzen’s first game back from bereavement leave; we found out earlier that Lorenzen had lost his father earlier this week. Lorenzen proceeded to hit a three-run home run, and things got really dusty in here. Lorenzen was clearly emotional as he rounded the bases, and when he touched home plate, he pointed toward the sky with both index fingers. In the dugout, the tears began to fall. Moments later, Reds fans were still on their feet, and Lorenzen emerged from the dugout for the first curtain call of his career. It was a really special moment at Great American Ballpark. –Good start for Tim Adleman in his return to the Reds: five shutout innings, five hits allowed, three strikeouts, two walks. He wasn’t sharp, but he worked himself out of every tight spot. Oh yeah, he doubled in a couple of runs, as well; it was Adleman’s first big league hit. Nice game for a guy that’s easy to root for. –Joey Votto hit a three-run home run in the first inning — his 20th of the season — and the game was never close after that. Votto was 2-3 with a walk, two runs scored, and four RBI. He continues to mash the baseball, and it’s fun to watch. –Ivan DeJesus Jr., Brandon Phillips, and Eugenio Suarez all had two hits. –Billy Hamilton had a single and two walks. Hamilton’s on-base percentage is up to .323 for the season. I keep telling you guys, Hamilton is the real deal. –I’m really glad that Keyvius Sampson was spotted an eight-run lead as he took the mound in the ninth inning. He was not good. In the end, he allowed a run on a hit and two walks. –Ross Ohlendorf was Ross Ohlendorf. –The Reds are now 20-12 in the second half. They’ve gone 35-34 since June 1. I gotta tell you, this team is a lot of fun to watch right now. –Adleman: 2-run double. Lorenzen: 3-run homer. Who needs hitters when you have these pitchers? 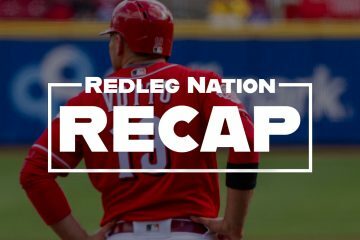 –The thoughts of Redleg Nation are with Lorenzen during this difficult time, I’m sure you’ll agree. That moment when he crossed home plate was really something. If he isn’t a fan favorite for a long time after that, I’ll be surprised. –Can you believe this? If the Brewers lose later tonight, the Reds will be tied for fourth place in the National League Central. Zack Cozart and Adam Duvall to return soon? Lorenzen is a good guy and a talented young player! That was pretty special for him. I lost my dad when I was 38. It was way too early. Its always too early but especially for guys like Lorenzen or Votto! They’ll never have those enlightening conversations about raising kids, etc. I was 23 when I lost my Dad, so I have some empathy for Lorenzen. What an emotional roller coaster for him. Happy he had this night. Sad for his loss. You never get over it. You just get through it. Tim Adleman is a good guy and a feel good story. But I sure hope he can string together a few good starts to showcase and get packaged in a Cozart trade to get the Reds something in return. Really nice game for Lorenzen. I’m sure his father would be proud of his achievements tonight and his overall work ethic. Sending positive vibes to Lorenzen and his family. I hope Lorenzen gets a chance to start. Increasingly seems like a decent possibility he’d be a very successful SP. Joey Votto is a beast. I had an instinct he would have a great game. Pretty sure this qualifies. Keep on raking Joey. I’m honored to watch you practice your craft. Eugenio Suarez is really coming around offensively and defensively. He continues to improve his offense while demonstrating above average capacity to play 3B. Call me optimistic, but I could see him hitting 285/330/515 with 20+hrs to go with average to above average defense. If Senzel continues his torrid ascent, Suarez becomes a valuable piece or one of them learns another position. Should Senzel falter, the Reds continue to play Suarez. Billy Hamilton needs to remain tied at the hip to Votto. He’s really looking like he can make a decent leap offensively. Props to Votto for mentoring Hamilton. I hope Votto’s mentoring is a trend. I really like Brandon Phillips, but I hope this is his swan song. Hope that he’s willing to take a back up role and, more importantly, mentor the numerous middle infielders in the system. The Reds fans love you BP. No reason you can’t continue to contribute in another way. We were at the game tonight, first game of our annual Reds weekend up from Atlanta. What a night. First Votto goes straight out to center, 3-0 Reds after 3 batters. Then Adelman goes all Houdini on us for five innings of wall banging exciting catches, adding in his first hit, first extra base hit and first RBI’s as gravy. Then Lorenzen is back and closes the door that Ohlendorf left open. Then Lorenzen caps it all with an emotional home run, home run trot, and post home run appreciation to his father, and somehow the fans knew to demand a curtain call. It was a good night to be a Reds fans. 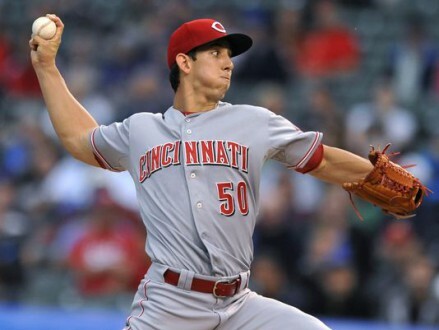 Condolences and positive thoughts to Michael Lorenzen and his family. Appreciation to all the Reds fans for welcoming him back so well. Wow. Not sure if anyone else picked up the moment between Votto and Hamilton after Votto crossed the plate following his 1st inning home run, but the Old Cossack found it very telling, or at least that’s how I interpreted the interaction. I wish we had the actual audio of the exchange. Oh and Votto should have walked in that 1st PA rather than hitting a dinger. The home plate umpire blew a ball 4 call prior to the blast. It was just that type of a night. It seems like Votto is the only guy with any real baseball IQ on the team, and I include the manager, GM and announcers in that. I have massive sympathy for the guy who has to constantly answer for the performance of this team when he should be the on charge. I guess he finally realized that the only way to fix things is take over. I actually don’t remember any other time the best player on the team was held to answer for everyone else. He is the best Red in 30 years. And just the other day he was tagging up on second with a hit ball. Too bad there were two outs and the hit landed which cost us a run. Votto may understand the art of hitting better than most but let’s not get carried away. These guys are pris and know how to play the game and even Votto doesn’t do it right all the time. The other day Votto was playing in and Phillips ran over to second and after the pitch Barnhardt tried to pick off the runner at first. It didn’t work but it was a smart play and it was executed well. I also think Welsh and Brantley do a fine job as announcers and I like what Jim Day has been doing. He’s just such an easy going guy its hard not to like him. Sorry auto correct on my phone makes typing messages difficult. They are all pros and Phillips covered first from second. Sorry about the mistakes, turns out no one is perfect, except maybe for this one guy I know. Agree and he does some boneheaded things in the field as well. I hope he can step up and make every a Red a better player as some feel he is doing. Votto also went out of his way to compliment Billy in his post-game interview. After watching Lorenzen’s home run about 5 times and reading about what he had to say that definitely is going to be my favorite moment from this year. Cannot imagine how strong those emotions are. Great moment, no competition in a lost year. My sympathies to Lorenzen. What a tough loss, and an emotional response. Props to him, and to the fans there for recognizing the moment. Lorenzen appears to be a world class guy, I’m glad he’s a Red. Brewers lost, so due to alphabetically aligned standing Reds are not in last place. They also knocked the Dodgers out of 1st and are only 15 games behind them for hosting the WC game. If my Math is correct Reds magic number is 55. That was a fun game indeed. Just keep getting better, and turn that magic number into 2018!!!! Votto continues to make an emphatic statement against NL pitching with his 2nd half surge of .445/.546/.700/1.246, and has now invited the the team along for the ride while he reels in the NL leaders. There are 41 games remaining in the season and this is getting interesting. Yeah, the injuries to the pitching staff were unfortunate at best and catastrophic at worst, but this happens. Teams like the Dodgers have so much cash to spend for depth that injuries can be shrugged off while players recover without totally shutting down a season. It’s the media money that MLB can’t touch. That throws everything out of whack. Votto has been pretty amazing and it was on full display last night. He looked really confident in the first, got his pitch and hit it 410. In the 3rd Norris threw 3 good strikes and Votto went down easily, but he had a similar at bat in the 7th and just guided a single to center after falling behind in the count. And earlier with the bases loaded in the 5th he didn’t try to do too much and accepted a full count, bases loaded ball four to push in a run. Vintage Votto. It seems unsustainable but he keeps doing it. So much fun to watch! Condolences to Michael Lorenzen. It took a lot of strength for that young man to talk to the press about the recent loss of his father. And kudos to Michael for providing an offensive highlight to the season. Out of the cellar, tied for fourth. Rock on and keep winning, boys! For those of us who have lost their fathers: it’s always a fresh wound when you think of them. I was 41 when my dad passed, and that was much too soon. Really feel for Lorenzen and the rest of you who lost them at a younger age. What a great job by the fans last night. Makes me even more proud to be a Reds fan. Both Nick Senzel and Jesse Winker had 2 hits, including a HR, last night. Since returning from the DL, Winker (age 23) is now slashing .321/.392/.405 in 148 PA (35 games) at AAA. Since joining the Dragons, Senzel (age 21) is slashing .309/.398/.549 in 193 PA (45 games) at A. With a strong finishing push, Phil Ervin (age 24) is slashing .260/.385/.458 in 117 PA (30 games) at AA. After a slow start, Aristides Aquino (age 22) is slashing .304/.346/.586 in his last 332 PA (79 games) at A+. Any or all of those 4 hitters could make a significant contribution to the next good Reds team. All 4 could be playing at AA or above by next season. I might add Blandino to that list as well. He really struggled at the beginning of the season, he was just dreadful. It should be noted that he was coming off an injury he suffered this spring playing for Venezuela. But he’s turned around his season. Since July began Blandino’s slashing .272/.357/.375/.732 with 38K/17BB in 157 PA. I think that Blandino has fallen down on the depth chart. They are looking at Renda pretty hard on the big club now, and with Peraza and the new guy from the Mets as middle infielders, and the Cuban they signed to play SS, Blandino might have taken too long to arrive. Well, Ervin is at AA, and I don’t think you mean Winker is not at AAA (grin). I expect Senzel to finish at Low A this year, and start next year at High A, and move to AA by mid -season if he continues to play like this. I would be wary of promoting him TOO fast, but I would expect him to be with Reds sometime in 2018, after starting that year at AAA. He does need some polish on his fielding skills, and will need to up his stamina as a baseball player into playing everyday for the long season. This wears down some young guys and college guys initially. Aquino is a terrific athlete, and he just needs to improve his pitch recognition and plate discipline to be a terrific major league hitter. In two years, 2018. He has CF speed too. He’s really made big strides this year in his strike zone discipline.